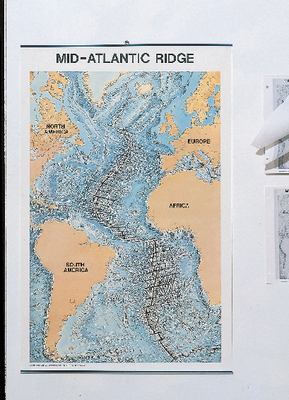 An accurate map of the Mid-Atlantic Ridge from 75° N to 60°S, clearly shows the mountain ridge system, the rift valley, divergent plate boundary, transform faults and volcanoes. Excellent for plate tectonics studies, the wall-size 24" x 37" map is full color on markable and erasable Texoprint, and comes with reinforcement top and bottom hangers. The notebook-size version is printed in black and white for student use.